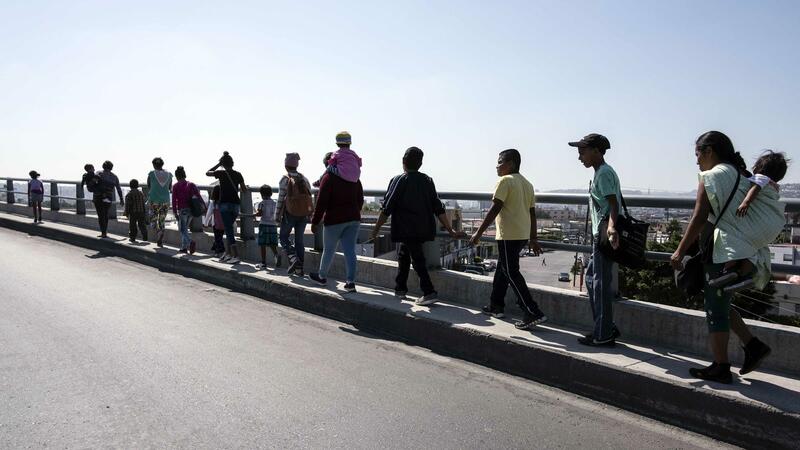 Central American migrants traveling in the Migrant Via Crucis caravan walk to their legal counselling meeting in Tijuana, Baja California state, Mexico, in April. On May 7, Attorney General Jeff Sessions said in a speech that "If you're smuggling a child, then we're going to prosecute you, and that child will be separated from you, probably, as required by law. If you don't want your child separated, then don't bring them across the border illegally. It's not our fault that somebody does that." Sessions announced the policy in Scottsdale, Ariz. Under U.S. law, entering the country illegally is a crime. The Trump administration has decreed that such attempts will be prosecuted, meaning the adults are detained, and any children who accompany them are separated. White House chief of staff John Kelly told NPR's John Burnett earlier this month that "the children will be taken care of — put into foster care or whatever. But the big point is they elected to come illegally into the United States and this is a technique that no one hopes will be used extensively or for very long. " Advocates note that many families attempting to enter the U.S. are seeking asylum from gangs and criminal activities in their home countries, and as such are not breaking the law. The U.S. is obligated to accept asylum-seekers under U.S. and international law if they can show a "credible fear" of persecution or torture. Lee Gelernt of the ACLU Immigrants' Rights Project said Tuesday that "Children are begging and screaming not to be separated from their parents, as they're hauled off to different cities. It's a harrowing situation, one that the president himself called horrible. No law even remotely requires the separation of children, and we filed a recent lawsuit arguing, in fact, that the Constitution prohibits this policy." In an interview with NPR's Morning Edition host Steve Inskeep Tuesday, former President Barack Obama's domestic policy director, Cecilia Muñoz, stated unequivocally that separating children from their parents was not a policy the Obama administration followed. "The Obama administration did not do that, no. We did not separate children from their parents," Muñoz said. "This is a new decision, a policy decision put in place by the attorney general," which Muñoz said "puts us in league with the most brutal regimes in the world's history." Still, the White House continues to blame Democrats for failing to act on immigration legislation. At a White House briefing Tuesday, senior policy adviser Stephen Miller attributed what he labeled "the current immigration and border crisis and all of the attendant concerns it raises" to the "exclusive product of loopholes in federal immigration laws that Democrats refuse to close." However, Democrats are the minority party in both chambers of Congress. The Republican-led majority has yet to take up significant immigration legislation in the House this session, although Speaker Paul Ryan, R-Wis., has committed to holding votes this summer. The Senate conducted a weeklong debate on numerous immigration-related bills in February, but none received the 60 votes necessary for passage.